The role of the People’s Republic of China’s (PRC’s) Coastguard’s expanding fleet has become blurred with that of the People’s Liberation Army Navy (PLAN) and aviation’s role is about to play a much bigger part in the posturing over disputed maritime zones. There are two types of coastguard, or rather two types of mission that they can perform: The first is very much in the civil role where lives are saved and people are protected in their maritime areas and closer to the coastline, hence the name ‘coastguard’. Coastguards internationally are considered humanitarian in purpose, as well as enforcing sailing laws and watching for smuggling and incidents such as pollution at sea. But that is a somewhat naive perspective, as there is also the coastguard that conducts the protection of national interests; from fisheries protection, national maritime boundary protection, and the protection of the nation’s economic resources. However the boundaries are becoming blurred. In the United Kingdom, the Maritime Coastguard Agency is a civil agency and not armed. For an armed response they would inevitably request the assistance of the Royal Navy (RN). This is unlike the United States Coast Guard (USCG) which is equipped with vessels and aircraft that are armed or can deploy arms when called upon to do so. 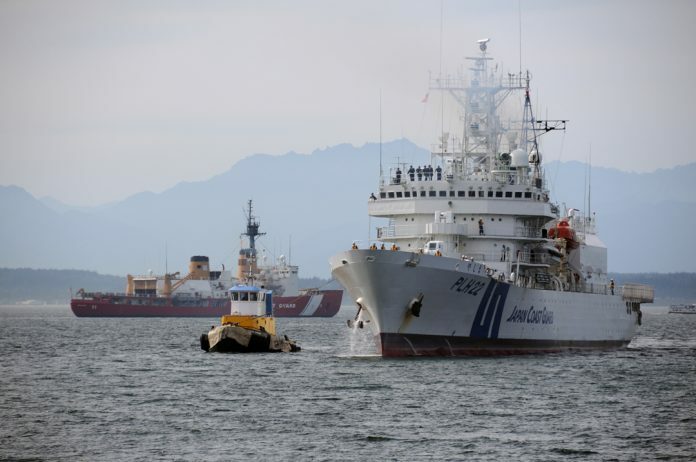 In the Asia-Pacific, the coastguard role is much more reliant on the military or a para-public force, and it is much more focused on national security. 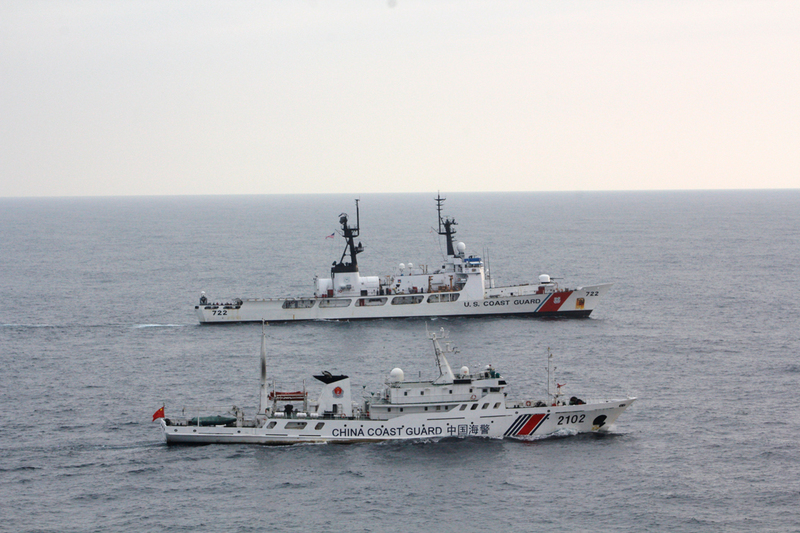 China’s Coast Guard (CCG) is an agency of the government but takes its direction from the Communist party leadership. As such, it is used alongside the PLAN and its role is becoming increasingly part of a proactive extension of the government’s ambitions. Protecting and extending territorial and economic zones is currently one of the PRC government’s main priorities, as has been seen in the island-building programme in the South and East China Seas. The use of the CCG is inextricably linked to that goal, albeit a slightly softer application. 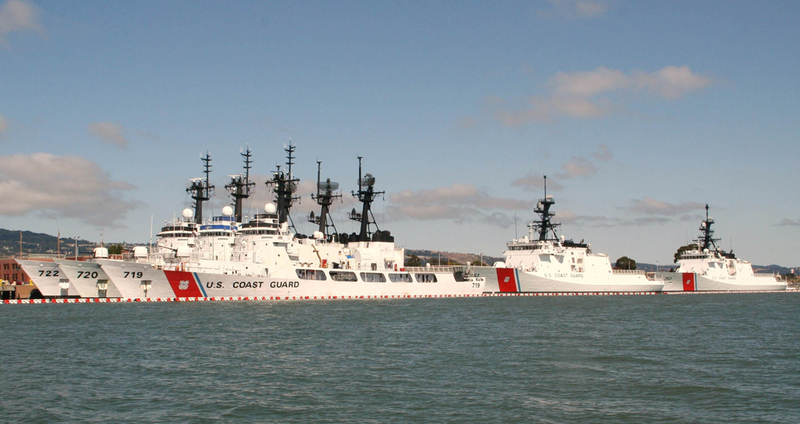 The formation of the CCG in 2013 has led to a rapid expansion of the surface fleet. It represents a collation of the following agencies (nicknamed the ‘Five Dragons’): Anti-Smuggling Bureau, Maritime Police, China Marine Surveillance, Fisheries Law Enforcement Command, and Maritime Safety Administration. One of the latest of the CCG’s new ships has been nicknamed ‘the beast’ due to its size and armament which blurs the lines between PLAN and CCG roles. CCG vessel 3901 will have a displacement of 12000 tons and will be armed with a 76mm rapid fire gun, several other auxiliary guns, has a helicopter deck and accompanying hanger. It will be the second of the CCG’s ‘mega-cutters’ and rivals the USCG’s biggest cutters, the new Northrop Grumman ‘Legend’ class National Security cutters (which are replacing the legacy ‘Hamilton’ class). A total of eight ‘Legend’ class are planned with the first five now in service but at 4600 tons they are only one-third the weight of the new CCG vessels. However, they are part of the USCG’s Integrated Deepwater System Programme (or ‘Deepwater’), which is a $24 billion 25-year programme with the intent of replacing the majority of the USCG’s aircraft, ships, logistics and command and control systems. 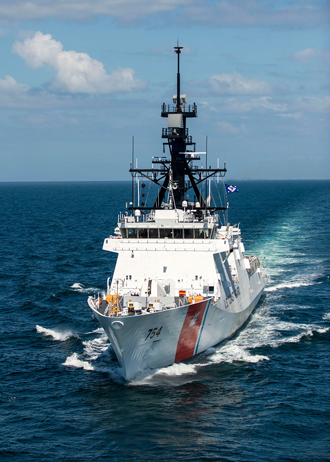 The latest of these cutters, the USCGC James (WMSL-754) comes well equipped with a Raytheon AN/SLQ-32 electronic warfare system, BAE Systems’ SRBOC/Nulka countermeasures launchers as well as a main Bofors Mk110 57mm gun. Most interestingly, its rear hanger can house a combination of helicopters and Unmanned Aerial Vehicles (UAVs)—either two Airbus Helicopters HH-65 Dolphin maritime support helicopters or four Vertical Take-off UAVs, or one helicopter and two VT-UAVs. These would have been Bell Helicopter’s Eagle Eye although the programme was cancelled last decade. Since then, the USCG have run trials with Boeing Insitu’s ScanEagle, the Northrop Grumman’s MQ-8B/C FireScout and most recently the smaller AeroVironment RQ-20 Puma. But the intent is there as the USCG’s Research and Development Centre keeps demonstrating. The Chinese are also exploring the potential of basing UAVs at sea. The beauty of such aircraft is that they have both long-range and long endurance. The acquisition and positioning of these UAVs to cover contested maritime areas would provide an enduring alternative to relatively expensive manned aircraft, although the cost of operations should not be underestimated due to the number of support staff required, as the US Army has discovered with its plethora of UAVs in recent years. Maritime UAVs, particularly for CCG vessels, would increase reconnaissance capabilities and would allow a relatively more rapid response to incidents than surface vessels, yet they could still be incorporated into the ‘soft power’ category. This would also place the PRC’s territorial rivals with the challenge of countering this capability with their own significant maritime UAV development. Last year the US Rand Corporation released a report entitled Emerging Trends in China’s Development of Unmanned Systems. When specifically looking at the role that maritime UAVs could fulfill, it confirmed a link to territorial disputes. The report quoted Harbin Engineering University’s Professor Ma who stated: “China shares the sea with many countries nearby. In these troubled waters, unmanned vessels can be more effective, convenient and safe than manned ships in many situations.” While this covered all unmanned systems including surface and sub-surface he also highlighted the value of UAVs. The Rand report references the decision by the PRC’s State Oceanic Administration (SOA) which oversees coastal environmental protection, national maritime rights and marine scientific research, in August 2012 to locate eleven UAV sites in coastal providences by 2015; whether this has been fully completed remains unknown. It also cites an incident that occurred on 9 September 2013 over the Senkaku/Diaoyu Islands in the East China Sea which are disputed with Japan and Taiwan. During this incident, the Chinese deployed a Harbin BZK-005 high-altitude long-range UAV over the islands which triggered a response from the Japanese who scrambled manned fighters to the scene. It proved illustrative of how tensions can rapidly escalate with the Japanese defence minister Itsunori Onodera subsequently announcing that Japan would “consider shooting down (UAVs) that enter Japanese airspace”. According to the Rand report, following confirmation from Japan that its Air Self Defence Force would engage further UAV flights in its airspace, the Chinese warned that such an action would itself be considered “an act of war” and in turn it would take measures to strike back. This example illustrates that the very sensitive nature of these remote island disputes can escalate into a potential hot conflict by over-flights and incursions, whether manned or unmanned. 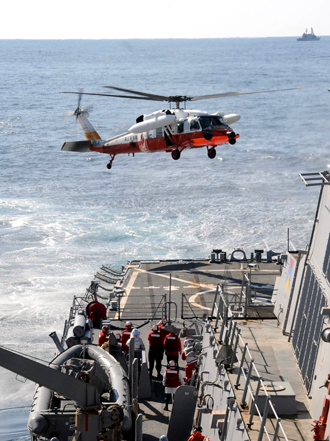 While it is undeniable that the surface vessel fleet is growing, the American research institute the Jamestown Foundation has identified one aspect of weakness in the CCG and MLE agencies, namely the strength of their traditional aviation assets and its capabilities. “Given the country’s lack of advanced, long-range fixed-wing aircraft, China’s constabulary forces must operate with only a fragmentary picture of the maritime domain,” the foundation reports. However this has not escaped the understanding of the Chinese government, which is now making a concerted effort to amend the situation. 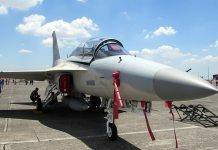 The Foundation explains that both surface and aviation units are significantly used for “rights protection”. 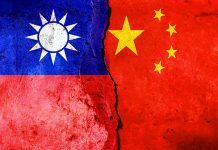 This is a double-edged sword as it mixes the protection of the PRC’s legitimate right to protect its internationally ‘recognised’ maritime zones, but also to robustly project a presence into disputed waters “to show administrative presence and impose Chinese jurisdictional prerogatives”. This it views as pursuing ‘illegal’ foreign activities, a mission that is central to the CCG and MLE roles. As with most aerial assets, the use of aviation in peacetime is more to provide a regular presence over large expanses of ocean and, more importantly, gather intelligence which can be fed into maritime command centres to assist in the coordination and response, where necessary, of the overall surface strategy. The CCG currently operates a very limited number of aircraft but is increasing these numbers as well as its helicopter force. It is controlled by the State Oceanic Administration (SOA) and the Ministry of Public Security (MPS) and is currently represented by units within China Marine Surveillance (CMS). Fixed-wing operations are conducted from three bases, each of which covers a strategic maritime area: to the north Bohai and the Yellow Sea, in the east to cover the East China Sea and finally in the south covering the South China Sea. Each base operates a couple of Harbin Y-12 maritime patrol aircraft with a maximum range of around 700 nautical miles (1300km).Their equipment include Automatic Identification System (AIS) receivers to allow them to plot the identity, speed and course of surface vessels using emissions from these vessels’ transponders. They can also communicate images to surface ships which can relay them via satellite to command control stations. But as the Jamestown Foundation points out, these minimal resources must patrol around 874,000 square nautical miles (three million square kilometres) of ocean and are somewhat overstretched. This, of course, is one problem that island-building in disputed areas such as the Spratly Archipelago is designed to overcome. Just as in the Second World War, where the strategy of ‘island hopping’ brought land-based air power into the theatre of operations to support the United States Marine Corp’s drive across the Pacific and allowed the long range Boeing B-29 strategic bombers attack Japan at ever-shortening ranges, so each of the PRC’s newly-formed islands is a new air base to extend its aerial presence to the edges of the nine dash line. Added to this is a new impetus to expand CCG and MLE aviation and reconnaissance assets, through the acquisition of fixed-wing aircraft that can go out to 2400nm (4500km). These could be in the shape of a maritime version of the Xian MA-60 turboprop transport. Another possibility is the newly-designed AVIC AG-600 amphibian. There are also advanced versions of the Y-12 that are about to make an appearance, specifically the Y-12F which will reputedly offer greater payload potential. Finally, the CCG operates a limited number of helicopters. There are several Harbin Z-9s, a licensed variant of what was the Airbus AS365 Dauphin naval support helicopter. The PLAN also operates up to 25 of this type. Encountering the CCG at sea is becoming a serious problem for the international community, particularly as it is likely that US Navy ships will be the ones to confront the ‘civil’ CCG. As a case in point, in October 2015 the USS Lassen, an ‘Arleigh Burke’ class destroyer, completed the first in a series of planned Freedom of Navigation Operations (FONOPs) in the South China Sea. FONOPS are navigation exercises in which the United States challenges air and maritime claims which it considers excessive. With a displacement of 9700 tons it is still smaller than the CCG’s newest cutter, albeit better armed. However, CCG ships do not have to adhere to the Code for Unplanned Encounters at Sea; a multilateral 2014 agreement to reduce the likelihood of incidents at sea developing into a larger confrontation. US chief of naval operations Admiral John Richardson described the PRC’s use of the CCG as a “grey area’ which will require creative thinking or further policy to avoid future aggressive encounters. On 19 January Admiral Richardson participated in a video teleconference with his Chinese counterpart, PLAN Commander Admiral Wu Shengli to discuss the state of relations between the two navies. According to a Reuters news agency report, during the conversation Admiral Wu stated, “Our necessary defensive step of building on islands and reefs in the Nansha (Spratly) Islands is not militarization, but this has been maliciously hyped up by certain countries and media.” Adm. Wu then contradicted this by saying that “we won’t (stop setting up) defences. How many defences completely depends on the level of threat we face.” The report added that three commercial airliners had been landed on its newly constructed airfield on an artificial island on Fiery Cross Reef “to see if the airfield was suitable for civilian aircraft”. Quite why civilian aircraft would want to land there was not disclosed, but the fact that the PRC is forcefully absorbing the islands against all international agreements ensures that tensions will continue to rise, and the CCG is being positioned to play a central role.